We made our way to the Þingholt (Thingholt) Centerhotel and checked in, but with some time to kill before our friend was set to arrive, Pumpkin Spice and I walked around the city and checked out all the little boutique stores. We had dinner at the Priomo Ristorante around the corner of our hotel which had an insanely good lobster bisque and then something to drink at before our other friend showed up. With our third friend tired and resting at the hotel, Pumpkin Spice and I went to freeze our asses off to see an unimpressive display of aurora borealis. According to our guide, what we saw was fairly mediocre. Not quite awe-inspiring, is it? Our other friends showed up the next day and checked into a different hotel (it might have been a hostel). We met up with them before we re-explored Reykjavik and went to the Blue Lagoon. At the geothermal spa, we checked our junk into lockers and showered before going to into the actual lagoon. With snow surrounding us on all sides, the lagoon itself was nice and hot (in certain places, it was too hot so I’d advise a bit of caution). There was also a bar in the lagoon so we had a steady supply of beer while soaking in the silica-rich water. Unfortunately, the dude with the beard wasn’t there with us. On the way back from the Blue Lagoon, our bus stopped at the geothermal power station so we could learn about—well, geothermal power. Reykjavik uses geothermal district heating, pumping underground hot water directly to buildings to keep people warm. The following day, some of us went on a little excursion to see some ice, snow, and a geyser which was nicer than my description and photos might suggest. So, yeah, Iceland is definitely a worthwhile place to visit. This entry was posted in Other Stuff and tagged A.D.M. Was Here, Blue Lagoon, Iceland, Reykjavik, Travel. Bookmark the permalink. Haha. Yeah, well, my camera sucked (it was my low end smart phone). It looked slightly better in person. I’d heard of the Blue Lagoon but not seen pictures, other than those painted with words. I’ve never been off North America so I haven’t seen it, or any other kind of wonder really (Not even the Grand Canyon 😦 ) but I am glad you enjoyed it. I haven’t seen the Grand Canyon, either. Should really just make the trip there sometime, instead of going to Vegas again. Thanks. I wish I had a nicer camera to capture it properly. The beauty of the photo is in itself. It’s so natural. Even if it wasn’t captured properly, it would still look beautiful. Nice shots! I’d never considered traveling to Iceland….maybe now I will. We absolutely loved Iceland. We were there just last month. I’ve done some posts on it. 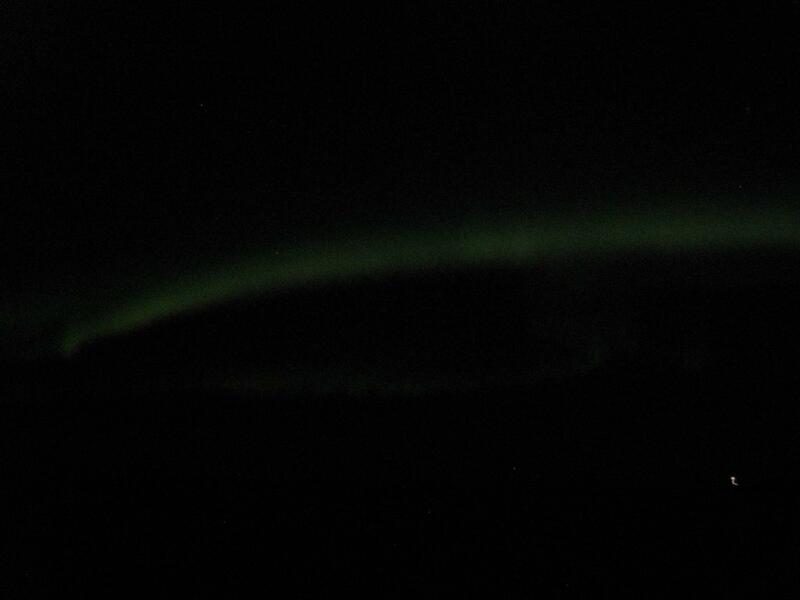 We were also luckier with the Aurora. Did you guys drive further East? We just stayed in Reykjavik and took tour buses to the Blue Lagoon, that geyser, and that spot for the lights (and other random places for photos—not sure if it was to the east). I’ve been to Iceland twice. Once I visited for two weeks and traveled not as much as I would have liked, but drove up the west coast with lots of stops along the way. I think Iceland is the best place I’ve ever been to. Great post and great photos. Thanks! That’s what we did. It was worth the price X 10. Phenomenal. The later photos convey what the rest of the post doesn’t really, the bleak beauty of Iceland away from Reykjavik and the main tourist spots. I was there in late February. The aurora is clearest in winter and well away from towns. But modern cameras exaggerate the colours. Seeing marked greens or reds with the naked eye is quite uncommon, but the camera turns a faint milky green-white into an obvious green. It’s magic, though, because of the constantly changing shapes. Some people brought tripods and what-not so they could have prolonged exposures when taking photos to exaggerate the lights. When I was going from the airport into Reykjavik, I felt like I was on the moon. We loved Iceland. Thanks for sharing this! Seems like you and your friends had an eventful trip. I truly love your last photo with the moon & sunset, very lovely shot.